Do you worry every time you see your horse eating green grass? Do you include checking digital pulses in your daily routine? Do you have nightmares about the only farrier who knows how to trim your horse moving to another state? The list could go on and on in the life of the owner of a horse affected with chronic laminitis. Even with good holistic treatment, relapses can and do happen. In this article I would like to address what conditions may bring a horse from health to chronic disease, and what it takes to reverse the process. These conditions apply to all horses with chronic disease and not just those with laminitis. Animals are born with a basic constitutional make-up which determines their overall strength and vitality. This constitution is inherited from the parents and not easily influenced after birth. The best way to produce horses with strong constitutions is to breed only healthy, strong, emotionally stable individuals. Unfortunately, this is not usually what breeding animals are selected for. So, from the very beginning, most horses have some level of weakness in their constitutions. Where and when these weaknesses will surface depends on the way the horse is managed. If a horse grows up under natural conditions with minimal stress, then symptoms may not appear until late in life. If, however, the horse is brought out of his natural environment and put under stress, chronic disease symptoms can appear much earlier. Some other triggers of chronic disease, such as horse laminitis, include drugs, vaccinations and inadequate or inappropriate nutrition. In my experience, homeopathy is the only healing modality strong enough to permanently change an animal’s constitution. Classical homeopathy addresses underlying constitutional weaknesses and imbalances. Other management tools, such as diet, housing, hoof care, chiropractic care, and exercise, can support the healing process for chronic horse laminitis. Let’s assume your horse has just come through an episode of laminitis. He is currently walking well and his hooves are growing out nicely. What you want to be watching for are other subtle signs of chronic disease which could indicate that additional treatment is needed. These would include symptoms such as poor hair coat, eye discharge, change in temperament, stiffness, sensitivity to hot or cold weather or weather changes. Horse laminitis is often just one symptom of chronic disease. If your horse is really free of chronic disease, you should be able to decrease supplements down to maintenance levels. If you continue to need therapeutic levels of supplements or many different supplements, then more work needs to be done on a constitutional level. A healthy horse showing no sign of chronic disease can also handle reasonable amounts of fresh grass and grains in the diet. It is not unusual for chronic horse laminitis cases to maintain a low-level digital pulse. This indicates some continued inflammation associated with a continued healing response. If the pulse becomes strong or is associated with increased lameness, it could indicate a problem. If your horse is doing very well overall, I believe a good management plan would include the following elements. The best diet is simple, low in carbohydrates, and high in fiber Small amounts of equine senior feed is acceptable for some laminitic horses, while others do well on a small amount (8 ounces) of oats or barley. At the same time, some laminitic horses can not tolerate any grains. A probiotic/enzyme supplement like FasTrack or Simplexity Spectrabiotic supports the digestive function and limits the production of endotoxins. Simplexity animal algae provides a source of food-based vitamins, minerals and antioxidants. Small doses of antioxidants such as Q10 may be indicated. You should not need to give more than 60-120 mg a day of a good quality Q10 product like those produced by Simplexity, Nutramax Comal, or Thorne brands. Generic brands of Q10 may not be active. I prefer to keep laminitic horses barefoot as long as possible. They must be trimmed regularly. If their toes are allowed to grow long or their heels allowed to get too high, then the normal mechanism of the hoof is impaired. 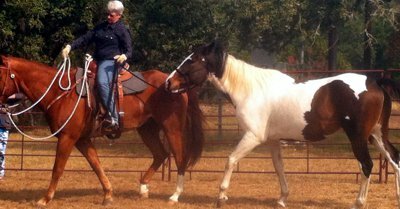 Overly correcting angles on overdue hooves creates unnecessary discomfort for the horse and sets back his effort to establish new laminar attachments. Don’t expect to be back riding too quickly. It takes close to a year to grow a new hoof. Turn-out on lush grass should be approached cautiously. Many horse laminitis cases have hormone imbalances that affect their sugar metabolism. Fast-growing, lush grass is high in sugar. As your horse gets healthier he will be able to tolerate fresh grass. I suggest gradually increasing exposure to grass over several weeks and monitoring digital pulses. It is also best to avoid hay that has been heavily fertilized. It is best to avoid drugs and vaccinations in horses with a history of laminitis. If drugs or vaccines must be given, then it is important to watch the horse closely to determine if any chronic disease has been triggered. In closing, I want to say that cure is always my desired outcome with chronic horse laminitis cases. This would look like complete return to full function without need for continued treatments or expensive management practices. Sometimes it is simply not possible, especially with advanced pathology such as pituitary tumors or severe bone damage. With these cases, palliation with remedies, special hoof care and high levels of antioxidant nutritional or herbal supplements may be needed. Most cases, however, can be cured with good homeopathic prescribing and proper management. The challenge is staying alert to shifting symptom patterns and resisting the temptation to palliate with large doses of herbs or supplements. I know I have many cases I have brought through crises but not totally cured. In my experience, chronic horse laminitis cases are perhaps the most difficult to work with and they can be the most rewarding.